I have already posted about the engineering challenges of making the Blue Line safe and enforcement of traffic and pedestrian laws along the Blue Line. To quickly summarize: the line is heavily ridden, safety improvements have been made, the overall accident rate has been dropping and there have been crackdowns on people breaking the law. 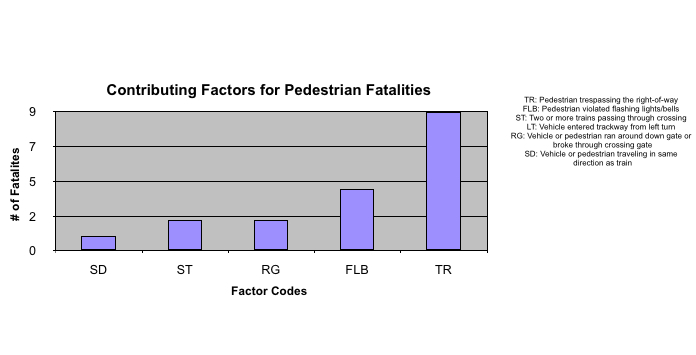 Yet, the rate of fatal pedestrian accidents has not dropped in the past decade. In today’s post, I want to look at some of the efforts that Metro has been making on the education front. The video posted above is one of them: a Spanish-language version of a video made to encourage safety along the line (an English-language version also exists). In 2003, Metro created its own rail safety program. Up until then the agency had been using programs developed by Operation Lifesaver, an international organization that at the time emphasized rail safety mostly for heavy rail. That is, passenger and freight trains – not necessarily light rail lines running through densely populated areas in Los Angeles (Operation Lifesaver has since added a light rail program). As part of its rail safety efforts, Metro has education programs that it provides to all schools schools located within 1.5 miles of the Blue Line, exceeding the state requirement of one-half mile (here’s a link to another video made by the agency aimed directly at children). The agency also offers similar programs to community groups and there are two Metro employees whose entire jobs are dedicated to educating the public about Blue Line safety, according to Metro officials. In addition, the agency has a mobile theater that can be taken into different communities and used to show safety videos. Metro has also taken a deeper look at accident data — and it suggests that efforts targeting children may be working. •The vast majority of fatal accidents have involved adults, with most of them men. 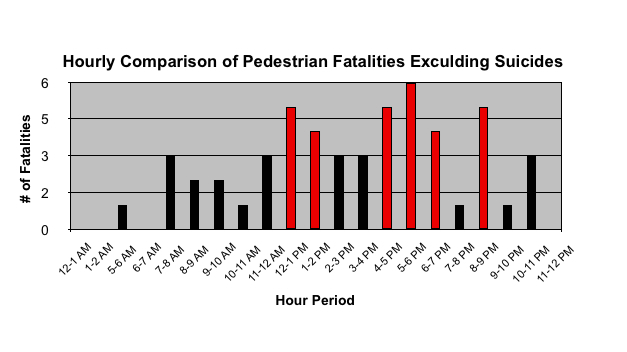 •The most accidents occur between noon and 1 p.m. and 5 p.m. and 6 p.m. See the chart below. Pedestrian deaths along the Blue Line by time of day. •In the past five years, trespassing along the right-of-way has been the most common contributor to pedestrian fatalities, excluding suicides. So what to make of all this? In the view of Metro officials, the lunchtime and evening rush hour accidents may be explained by people being in a hurry. There also seems to be the issue of some people — particularly adults — ignoring posted warnings, leaving Metro to struggle with the question of what’s the best way to engineer safety warnings that reach the most people? Finally, there is the very uncomfortable issue of suicide — something, quite frankly, that seems to go beyond education efforts. There have been 22 along the Blue Line since 1990 and the majority have come in the last decade. The Federal Railroad Administration launched a study several years ago of suicides along rail lines in the U.S., of which there are about 300 to 500 a year. The agency is trying to determine patterns to the suicides and if there is a way to better deny access to areas where people can willingly harm themselves. Here’s a link to a Boston Globe story on the issue. To wrap up our series on Blue Line safety, my colleague Fred Camino will post tomorrow about some particular observations he made regarding safety on the Blue Line. If you have a comment on our Blue Line series, please email us at thesource@metro.net.